There were a few persistent flaws or sources of discontent with this pack, which eventually had to be remedied. Ergo the monster below, and yet another doorway/Bob map photo. It’s been tested in a very basic manner on a dayhike, but backpacking with Little Bear in Utah next week will be it’s first real trip. The first issue, and by far the most apparent, was accessibility. I can almost always pack a ton of stuff well enough to not have to dig deep mid-day, but 4 of 5 reasons for having packs this big is to carry other folks stuff, and in my experience it is simply not possible to ask others to be as organized as I am (or to communicate their system with me). It didn’t take too much time on this trip or this one (can you get that thing, you know, the one in the food bag you buried in the bottom this morning?) to realize that a better arrangement, unfortunately involving a zipper, was in order. 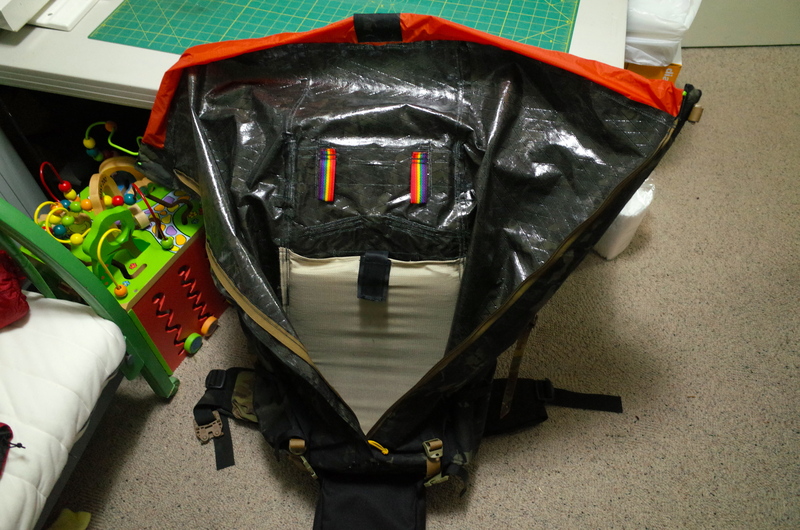 Full-height zipper down the middle of the front panel. #8 standard YKK coil with a big X50 flap and a single slider opening top-down. The top buckles shut for security. 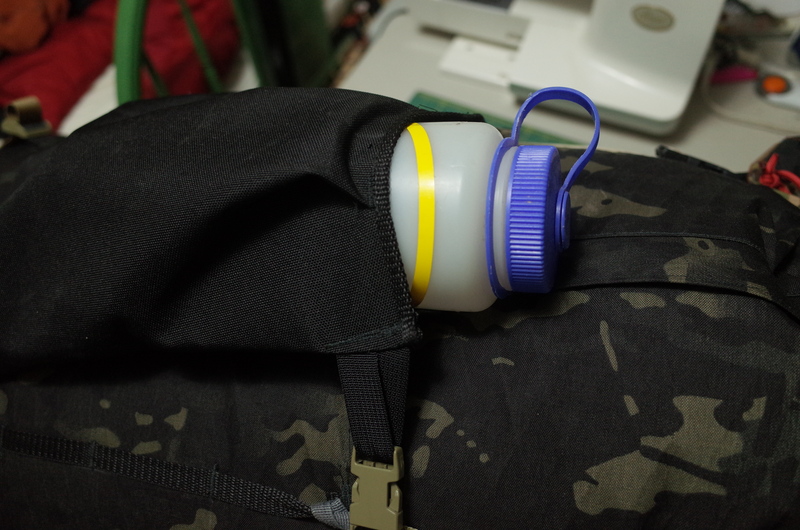 The whole thing can be blown open for packing (or carrying massive items in freightor mode using the compression panel) or the zip can be opened without uncinching the top to access certain items. I contemplated putting a second slider at the bottom for more convenience, but couldn’t get over the certainty that placing a metal pressure point in one of the highest wear areas of a pack would be asking for a hole, so I refrained. Second issue was size; the first big pack was not too big, but it was too tall, especially when a lid was added. Gen 1 was 42 inches tall, with a 42 inch upper circumference and a 38 inch lower circ. This pack is 36 inches tall (measured totally unrolled, along the back panel), with an upper circumference of 47 inches and a lower circ of 42. The way this interplays with the Paradox frame makes the pack, especially the upper part, get wider as much as it gets deeper, which seems to be the way to go if you’re trying to weasel excessive capacity out of a pack which can still fit through thick brush. 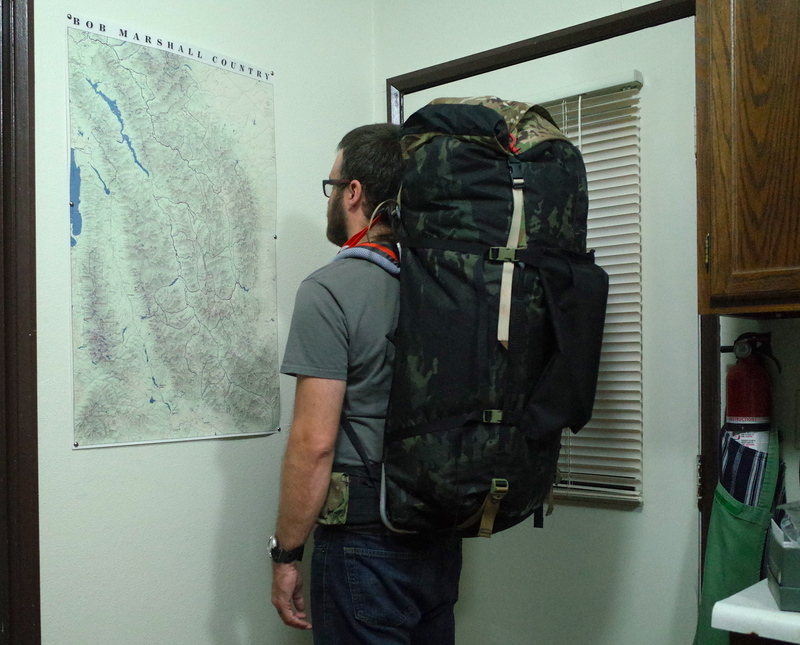 Spitballing capacity by relying on what other manufacturers rate their packs (specifically the EMR II which inspired the zip), this pack is a hair under 100 liters or 6000 cubic inches. When I think about trips in the near future, when one of us will be carrying the kid and the other will be carrying virtually everything else, this is in no way seems to big. 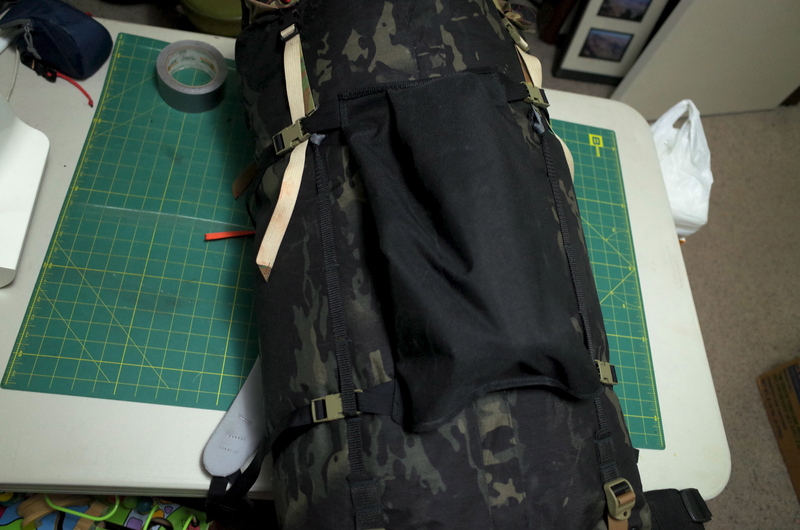 DItto for packraft hunting trips. 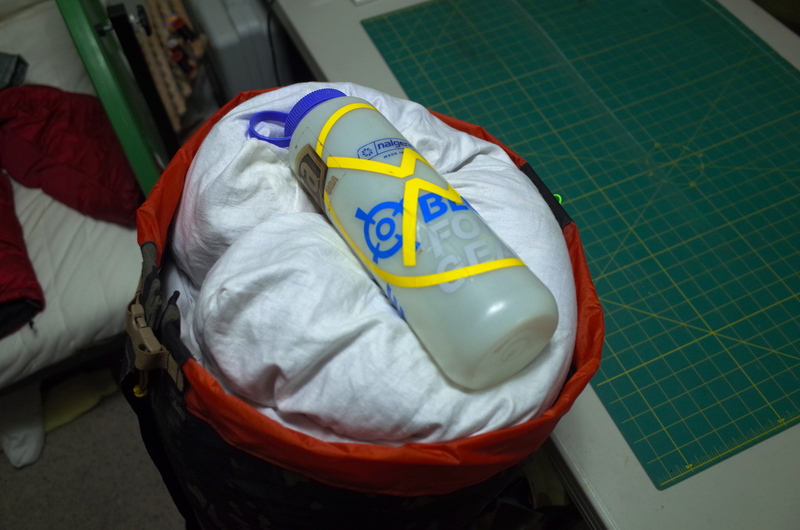 The third issue was the desire to do a little to avoid the poking and barreling issues I had with only a single layer of fabric between my back and the pack contents. I spent too much time thinking of solutions, and in the end went simple with a sleeves inside the pack. 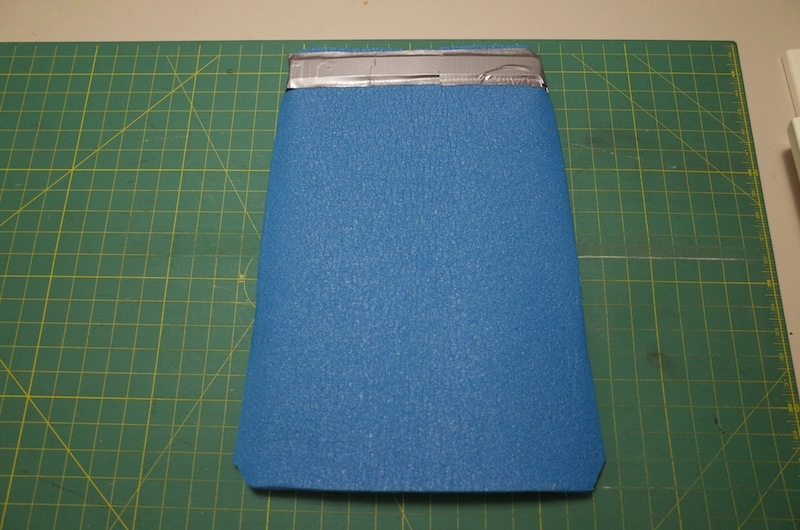 A single layer of Walmart blue closed cell foam goes into this, with a 1 inch by 1/8 inch aluminum stay duct taped to the top of the pad. This stay runs horizontally across the base of my shoulder blades, and having that bit of rigidity seems key to keeping loads under control. And it is easily removed if I don’t want it. 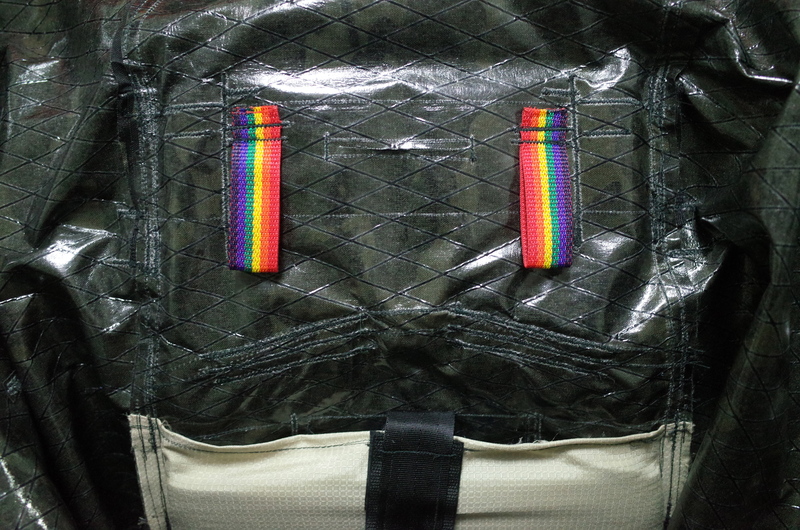 The rainbow loops are reinforced for hanging game bags and thus keeping the weight high and tight where it belongs. The fourth issue was durability, and was addressed by using X50 for the main body and 1000 denier ballistics for the bottom, compression panel, and high-stress areas of the suspension. The X33/1000D cordura of the old pack had years left in it, but a few holes had appeared and it was generally apparent via skid marks and chafing that for truly long term, worry free use a bit more burl was needed all around. Other than those four things designing this one was a simple matter of refining standard features, such as the bottom panel tied into buckles sewn to the pack. 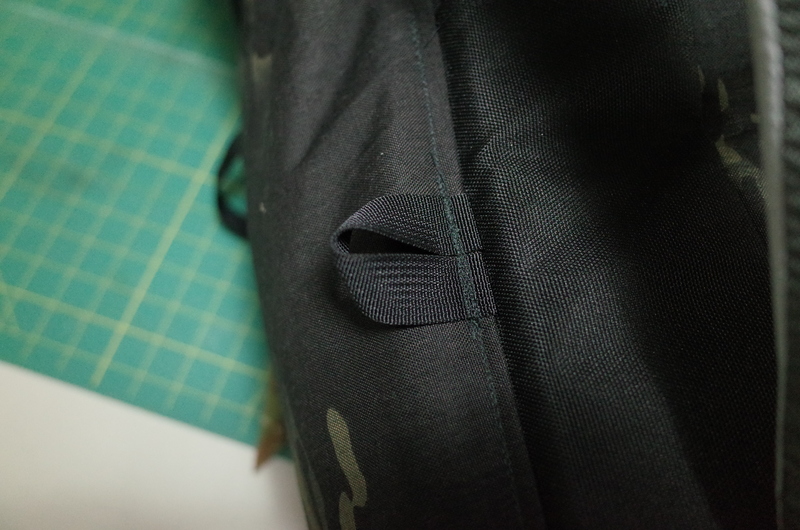 This flap holds the frame in place at the bottom, and provides compression to shrink the bottom when the pack is underloaded (again, keeping the weight high). The bottom is canted three inches up to avoid catching to things as you downclimb. The compression panel is a simple pocket, with an open top that cinches closed when the upper compression straps are tighted. Big enough for a small static rope or a wet shelter only, so as to not tempt putting weight way out back. The panel is narrow enough, buckle to buckle, to compress completed flat against the frame for day hunting. I only used two compression straps on the panel, and they’re spaced almost 15 inches apart, because most of the time more is overkill. 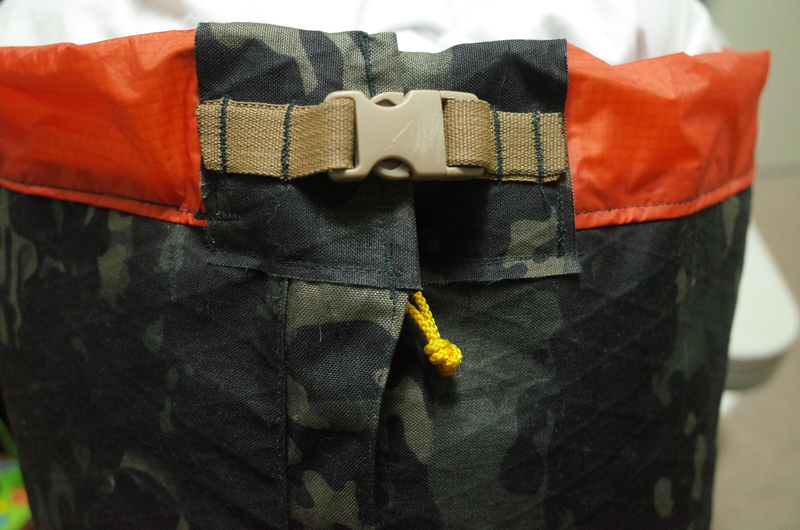 There are occasions when a third anchor in the middle is needed, and to that end I added a webbing loop in each side seam into which straps can be hitched when needed. The lid is X33. Much though it pains me to admit it, a lid with 4 points of compression has a lot going for it when it comes to controlling the top of a big pack. Detatchable side pocket are in the works, but not yet ready for prime time. 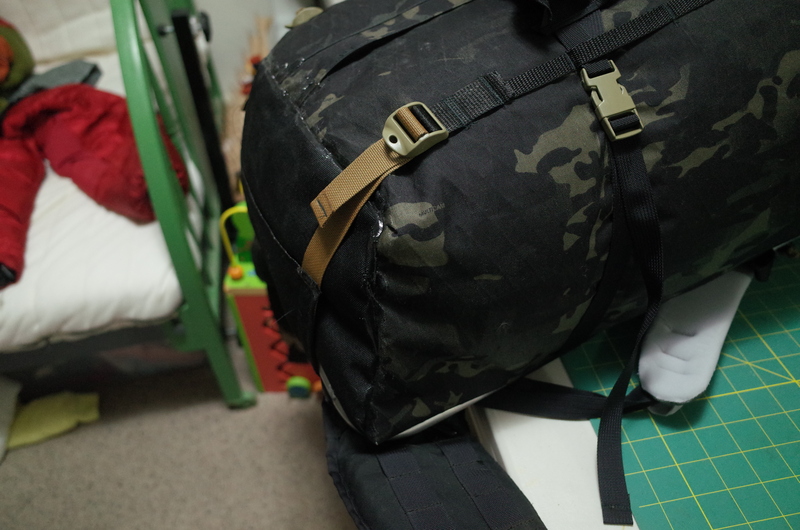 Because I tried to keep things as simple as possible, this pack ended up very light for something so large and tough. I’d guess closer to 3 pounds than 4, all up as shown here. More than anything this is a testament to why the Paradox frame system allows for light packs: it minimizes to a massive degree the amount of supporting and reinforcing junk necessary for a pack strong enough to carry heavy loads in abusive situations. I look forward to staining it with sandstone. You got it; added to post above. Its easy to tear the foam along the tape line if you get agro putting it in the sleeve but it is easy and effective. Well done. That’ll be sweet for sunning out the inside after hauling around a few days worth of dirty diapers. I’m loving the X50 btw. Excellent stuff. Not sure how to tackle the diaper issue. Been a while since i had such ambiguity backpacking. We just garbage bag it and let them dry out a bit in the sun when/where appropriate. Heads up I sent you an email but not sure if it’s an account you check frequently (@yahoo). Sub four lbs for 100 liters. Kudos. 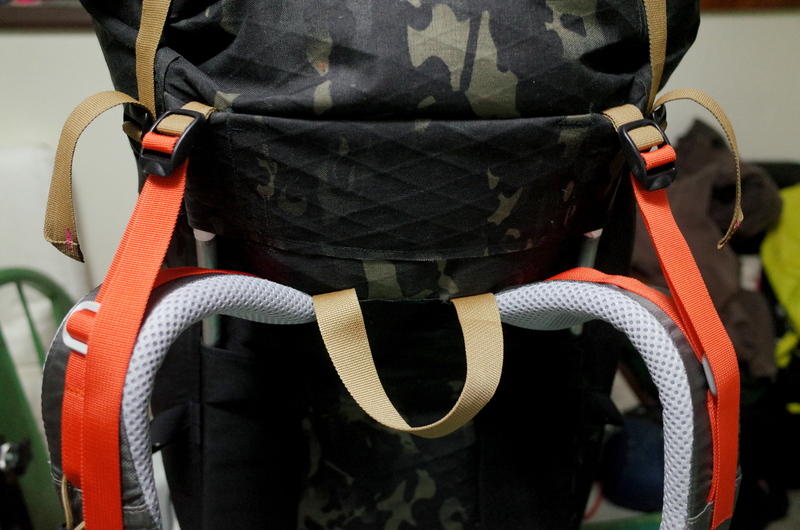 Not having to worry about suspensions has really opened up your creativity with packbags. Pretty cool. It’s a suspension which is simple enough that I can build on a conventional machine with no compromises whatsoever w/r/t durability. Can’t say the same of lumbar pad systems. Not even close. Hours less sewing time, too. Wow another great pack. Excellent work. You should definitely design a baby carrier when light bear gets a bit older. Halfway done at this point. Carrying kid and ~3000 cubic inches of stuff is the challenge.